The mountainscape styles pictured below can be woven for you in the size and colors of your choice. Tina sometimes has mountainscapes available for immediate sale. 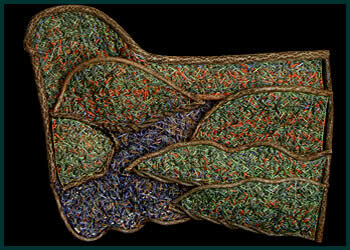 Please contact Tina directly to make a purchase or commission her to make you a custom woven mountainscape. H 23" W 54" D 6"
Three mountains at fall's peak in Connecticut, where I live. The brilliant colors of the trees' leaves are captured in reeds in various tones of red, dark orange, and mustard, with dark green reeds interwoven at points to capture the contrast of the evergreen trees on the hillsides. 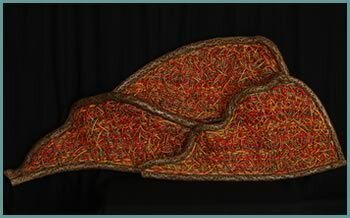 This quite three-dimensional piece is woven in the "dimensional weave" technique which I developed myself, and is framed in bittersweet. View enlargement. View construction detail. H 40" W 50" D 8"
When I looked at the mountains around me, I could see layers of colors. To achieve this effect, I added layers and layers of colors by weaving strands of reeds of various colors over the tops of each other. The mountains are woven in shades of greens, browns, some blues, chestnut and rust. The lake is woven in shades of blues, browns, and some greens. The frame is bittersweet.